Here's another one of my favorite classic AD&D supplements from my gaming library. The old Rogues Gallery! Featuring art by Erol Otus, Jeff Dee and others. Good stuff, mostly it consists of stats of various characters, but where it REALLY shines is the personalities section towards the back. This section features the player characters of some of the TSR staff at the time (Gygax, Otus and others) fully statted out with magic items and background information. Some really cool "out of the box" characters. I've sat down many times when I've started designing a new campaign and looked at the personalities section of this book to help me work up interesting NPC's and such. My players have unknowingly met/dealt with tweaked (renamed) versions of Bigby, Grimslade, Robilar and others. Several of them make for great villains or at least rivals. One thing I've learned over the years of DMing is that the key to a successful Campaign is a great villian! A few years ago, I acquired the Extradordinary Book of Names by Troll Lord Games. It was a bonus bit of swag added to an order I had placed, so I wasn't expecting it. Needless to say I was pleasantly surprised. I have found it to be very useful for my campaigns. Especially my fantasy games, but it is useful for other genres as well. While not the most user friendly product, after a bit of digging and usage, I've gotten pretty good at flipping through it as needed. In addition to character names it even helps the GM work up place names, organizations etc. I believe it is now OOP. Mind you Gygax didn't write the book, although he contributed in places I believe, it is still a good book to have. Especially for those of you who have player's that need a bit of help in the naming their character department. 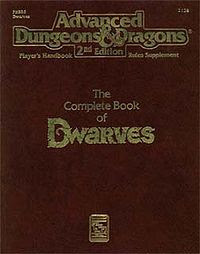 Here's another one from my gaming library; The Complete book of Dwarves. It's for AD&D 2nd edition. You don't play 2nd ed. you say? SO WHAT! Neither do I! I traded in most of my second ed. stuff years ago, BUT I kept this book. Why? Cause it's cool! The section on Dwarven name generation is very helpful, but the true gem of this book is found in the section about Dwarven strongholds. It has an awesome Dwarf stronghold generator, all kinds of cool tables and such. Whenever I'm working up a Fantasy Campaign, or in need of some Dwarven coolness I turn to this book. You can find it for fairly cheap on Ebay sometimes. Well worth it IMHO. Central Casting Series; Old School Goodness! Thought I'd share some old school goodies from my gaming library. 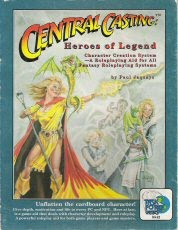 The Central Casting series is something that has seen EXTENSIVE use at my gaming table. Whether it was fantasy, Sci-Fi or Modern, I love these books. They help players roll up really cool backgrounds, help a DM with "creator's block", they are really versatile tools. 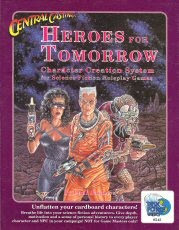 I remember using the Sci Fi one (Heroes for Tomorrow) for an old Gamma World Campaign of mine. The player wound up being a half blind, albino mutant cat with a cyber leg/stump on the run from a religious cult due to his miraculous healing powers. I told the player, sorry about the bad rolls, I'll let you start over, he said," are you nuts?! I love this character!" The books are long out of print but if you can find them for a decent price grab them up! I need to get new copies mine are quite ragged looking. They are uber versatile, we used the Modern one to do backgrounds for our recent Mutants & Masterminds campaign, the guys loved it! Another point of coolness, they even have conversion notes on how to do stuff for other games, nothing recent of course, but still helpful. Aside from character backgrounds, they help the GM also. NPC's, businesses, wars! All kinds of cool stuff! I find these to be an essential part of any campaign/world building that I do. Can you tell I love these books!!! Just messing around with my 15mm stuff. WIP on a Compound for the troops to fight over. I particularly like the Stonehenge feature. My wife found that at Barnes & Noble it scales perfectly for 15mm. Some of the painted miniatures are Rebel Minis (Bio Suit troops), Stan Johansen (Blarad & Dracons), RAFM Urchin Spiders, +others. I can't do closeups with this camera to show you scale stuff. Sorry. Just a shot of some of my current projects. Some 15mm's I'm fixing to #10 washers. Sorry for the poor quality picture. I'm using my daughter's cheapo camera till I get a new one. I didn't get to attend the last 4E game, had some family type stuff to do. I hear it went ok, although half the group didn't make it. We are looking at shuffling the group a bit, trying to find some new members that can meet somewhat more regularly. Also looking at changing locale and game day/time. Playing at the FLGS keeps my furniture intact (last group that gamed at my house accidentally broke a chair and a window, no alcohol was involved), but some of the "locals" at the FLGS can be a tad bothersome. We shall see, I miss the marathon game sessions of my youth, but being an old coot, means I just can't stay up all night gaming like I used too. The guys are interested in possibly trying out the Pathfinder RPG, but we are also discussing other options. I've been eyeballing Savage Worlds (Explorer's Edition), and with our game time being so limited and it being hard for everyone to make it regularly, Savage Worlds might work better in the interim, at least until we can get the group "reworked". It does seem to live up to its buzz words; Fast, Furious, Fun! Speaking of Savage Worlds I found a pretty cool webcomic for one guys gaming group http://shawntionary.com/clockworks/ it's based on a Savage Worlds Steampunk/Fantasy Campaign. I've never tried Steampunk but the comic is pretty cool. First off I've really been enjoying blogging, I've "met" some great folks and have been having a ball. I've been reading the Pathfinder rules, and we are talking about starting up a Pathfinder Campaign soon. We should be wrapping up our 4E Campaign this Sunday. Unfortunately my camera has died so it will be a bit before I post any new pictures of my miniatures. I've got quite a few that my friend Boomer has painted for me that I need to get posted, but that will have to wait for a bit. In other news, I have really been getting into the 15mm miniatures scene. For fantasy I'll stay with 28mm (I've just got too much invested to switch), but for Sci Fi 15mm is just too tempting to resist. Several key factors prompting this are cost, space, an ever growing variety in the 15mm market, ease of transport, oh and did I mention COST? Anyways I'm slowly building up an assortment of 15mm miniatures, even have alot of them painted (woo hoo! ), what I'm trying to decide is if to post 15mm stuff on this blog or start up a new one totally devoted to 15mm sci fi gaming?? Too Many Minis?? That's not possible! 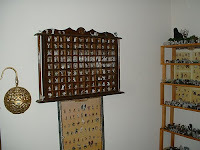 Several pictures of my "Gameroom" As you can see I've got a "few" miniatures. 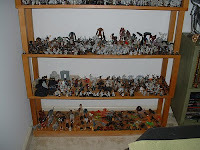 I've been collecting since 1979. Some more minis! 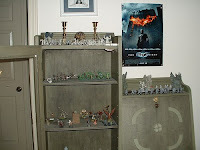 Second shelf from the top has several Dwarven Forge Lizard Men vs. Dwarven Forge Orcs! My mini Graveyard! Some Dwarven Forge Skeletons amongst other undead and gravestones. 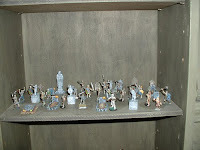 The smaller statues are conversion work I did from some old busted Ral Partha miniatures. 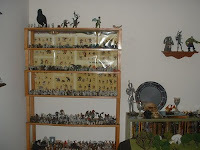 Another shot of the minis shelf. Including a few "toys" I've acquired that work perfectly. And here's a few more. 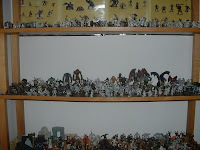 My painted ones I keep in containers to ward off the evil Dust Elementals lurking in the house. It's Big! Massive actually. Course it is the Player's Handbook and the DMG combined. I haven't really had time to do much more than scan it. Production-wise it is a beautiful book. I've always loved Wayne Reynolds art. That was one of my many disappointments with 4E (the art) for me. Layout is nice. Like I said I have really only been able to scan through it and read tid bits here and there. My wife wanted to know about Necromancers and Half-Orcs (I love that woman! 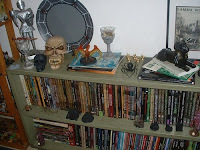 ), we both liked what they did with Half-Orcs, and she and I both loved the Sorcerer blood-lines (Undead blood-line cool!). I like the changes to the Cleric. Glad they dropped Rage Points from the barbarian. Not sure how I feel about them using Monk Ki points. All in all I see lots of options for players! You can really tweak your character with these rules. I think it is safe to say if you didn't like 3.x you won't like these rules. Pathfinder lives up to it's roots, it is clearly strongly tied to 3.x. But they have added some really nice changes to it. If you liked 3.x I think you will enjoy this book, even if it is just to houserule some of the stuff from it for your 3.5 Campaign. 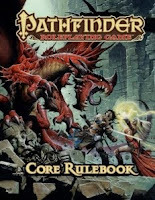 Well the new Pathfinder RPG is out as of today. My FLGS should have my copy this afternoon. My friend Derek is at Gen Con (drat his hide!) and he indicated it is selling like crazy. The Paizo guys put a limit of six per person, and Derek says some people are buying that many! Sounds like some heavy backpacks! I'm looking forward to getting my copy. Curious to see what changes they made from the Beta copy. While I'll admit 3.5 wasn't perfect, I've had some incredible game sessions playing it over the years. I applaud Paizo and wish them well. So keep your fingers crossed, tonight will hopefully be a sit down with an exciting new book full of adventure possibilities! These two Reaper minis, painted by Don. Don's character; Bungo the Halfling Knight and Dana's character ; Petra the Gnome Cleric. These were their characters in our C&C Campaign. 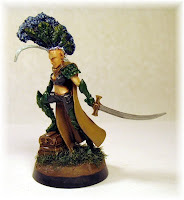 Here's a Games Workshop miniature. I believe it was originally supposed to be a Dark Elf Assassin. Don painted this one up for me. I haven't gotten the chance to use him yet, but I'm sure at some point I'll have a need to unleash an assassin upon them. Good times! Time ran out before we got very far, but we are talking about playing it some more. 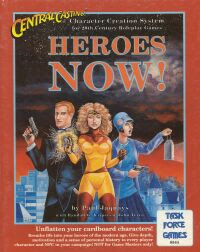 We had such fun I'm thinking about digging out my copy of Mutant Future maybe run them through a "Thundarr the Barbarian" type game. Stay tuned! Back many years ago Roger Moore (not the James Bond one) used to frequently contribute to Dragon Magazine, back when it was in print and came to your mailbox! *sigh*. He wrote of one of his characters a gnome he named Harley Davidson Quinn. To me the above Reaper miniature is how I envisioned this character. Painted by Don Moss. Some might say I've got too many gaming books! The sad part is I used to have alot more! I'm thinking about whittling these down some more. Most of the ones pictured at 3.5 books, bottom shelf is alot of Rifts books. We don't play Rifts anymore, so I may trade in some of them. 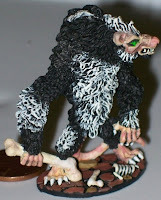 Here is a Reaper miniature "Skrattle" painted by Nitia. Love the work she did on this guy. She said she wanted to go with a fur pattern that looked like someone's pet rat. I think she did an awesome job! I have big plans for this guy. Should make for a nice surprise for my players. Usually when fighting were-rats they think of small, sneaky types, I see him as a nasty Were-Rat Ogre, a mass of muscle and visciousness. First let me give some background for those who may not have read some of my earlier posts. I've been gaming since '79 or so, lots of D&D in its various incarnations, but lots of other games also; Rifts, Star Wars, Chill, Traveller etc... I like to try and play lots of different games/genres, but I always come back to D&D. Fantasy RPGing just feels like home to me. So we've been playing for awhile, I've gotten to DM and be a player for 4E. 4E has some fun things about it. I like some of the ideas it presents, it does seem to take away some of the DM work of running higher level combats. Initially it was cool learning the new powers and abilities and seeing how the players used their abilities. Monsters are fun in surprising ways. I've even created monsters on the fly during an encounter, something that is a bit more challenging to do in 3.5 (but not impossible). Minions are cool. Anyways... 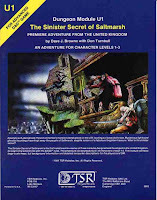 I feel that I can now make a fair assessment of my personal stance on 4E, I've actually played it rather than looked/sneered at it from the distance. Mind you this is my personal opinion. Not a bash at others. Guess you can tell where this is going. I can honestly say I don't like 4E. To me it plays more like a video game than an RPG game. They changed too many sacred cows for me. Alignment...yuck. magic items...blech. Marking....no thanks!, there are others, those are just off the top of my head. My group seems split. A few like it (especially the younger players), but many of us don't. We've decided to wrap up our 4E Campaign next game session and then decide where to go from here (Pathfinder is out soon, we may give it a look). I may keep my 4E Player's Handbook, but I'll be trading in my DMG and MM, I just don't think I'll be needing them. For those of you who are fans of 4E I wish you the best. I'm not knocking you or your enjoyment of the current edition. It's just not for me. 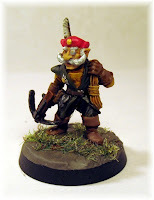 This is actually an old OOP Grenadier miniature for Star Wars. It was painted by Nitia and briefly used to represent one of my player's characters; a Tiefling Warlock in our 4E Campaign. 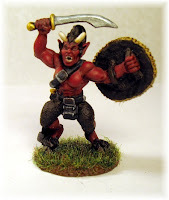 A demon warrior miniature from Reaper. Painted by Don. I haven't gotten to use this one yet. Soon...definately soon! 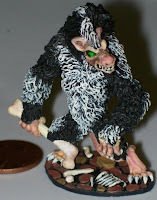 Above is "Tally" a Reaper Miniature painted by Don. 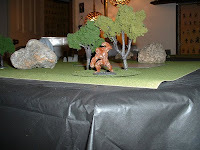 Tally, a gnome druid, was one of the characters from our Castles & Crusades Campaign. "Petra", another little lady from our C&C game. Petra was a gnome cleric. 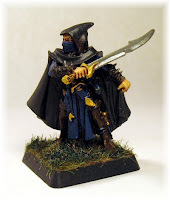 A Reaper miniature painted by Don.